Butternut squash harvest – happy FALL! 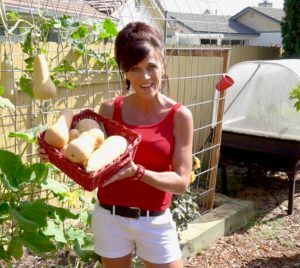 Several of you mentioned that you are successfully harvesting a fall crop of butternut squash with the tips from the last blog post. Great job! Now what to do with it? The best advice I can share you is keep it simple! We all have busy schedules – who has time to spend hours in the kitchen? 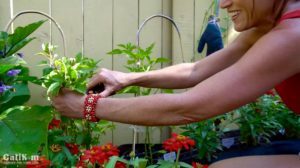 We work hard to grow our own food and it’s important to know how to prepare quick, simple meals out of our homegrown veggies so we can reap the benefits – and be healthier and happier as a result. Butternut squash is colorful, sweet, creamy and delicious, and makes for a perfect fall meal. 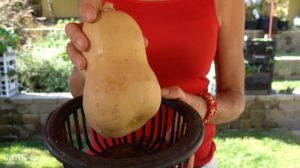 After you’ve read this post watched the video below, you’ll know exactly how to prepare a simple tasty side dish from your own homegrown, delectable butternut squash. 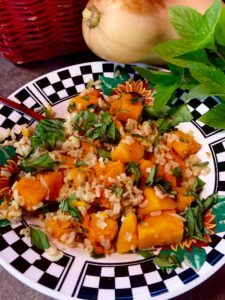 Butternut squash herbed rice – quick, simple and delicious. 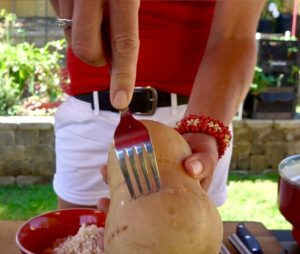 Your family will gobble up this colorful, tasty side dish – and you’ll feel the satisfaction and pride knowing you’re providing them a clean, healthy meal that you grew yourself!. Add chicken or ground meat to make it a hearty entree. It’s so delicious, you’ll want to have guests over to share your garden fresh goodness! I love grocery shopping from my own backyard – can’t get fresher and more local than that! So…why not cook in the garden right where I harvest? I set myself up with a basic “kitchen in the garden” and away we go (watch video below to see cooking in the garden). Persian basil adds a punch of flavor – use whatever herbs are growing in your garden. 1 medium butternut squash, 1 medium onion (any kind of onion), fresh herbs (I used Persian Basil & Rosemary) use whatever herbs you have growing in the garden, garlic clove(s). Butternut squash is so colorful – perfect for fall! Pre cook your butternut squash whole in your crock pot on low for 2 hours, or in a 425 degree F oven for about 1 – 1 1/2 hours, checking frequently so as not to over cook. Cook it just until you can puncture the skin easily with a fork. 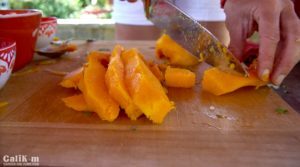 Do not over cook – you don’t want a mushy squash. Bake butternut squash whole just until fork tender. Cool butternut squash, cut in half lengthwise and remove seeds. Cut into cubes. Chop onion, onion top, and basil. Preheat your skillet over medium high heat with a tablespoon olive oil. Saute onion, onion top for a few minutes until softened. Mince garlic, add to onion mixture. Add 1/2 tsp cumin, salt and pepper to taste. Add butternut squash, heat through. Plate up and top with fresh basil, cranberries, walnuts – whatever you like! Add meat to make it an entree. It’s so fun to share garden to table meals with family and friends! I love how quickly this recipe comes together – and always make up a big batch so we can eat it the leftovers all week long. 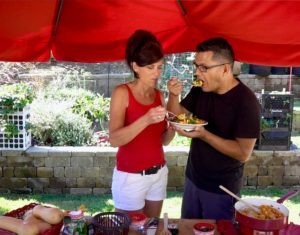 It’s so much fun to share the garden fresh goodness with my family and friends – they love every bite. We enjoy eating it in the garden – right where we grew it! Watch the video from my YouTube channel, “Butternut Squash Rice with Basil and Rosemary” so you can see exactly how to make this nutrient packed dish that brims with freshness and flavor. Comment below – let me know if you’ll be making this garden-to-table recipe and how you’ll customize it based on what is growing in your garden! Making it right now, Kim, with half a kabocha. Will let you know how it goes! My daughter loves kabocha and rice, so we may not have any leftovers for tomorrow’s lunch! It was very good! I was luck to have some leftovers for lunch as it made a lot. My daughter can only eat that much! And she liked it. I used some basil pesto I had made last week instead of the fresh herbs. That worked well. Love that butternut squash, rice and herbs, Kim… LOVE IT.!! Just got over here on your blog for the first and wondering what took me so long.. Must share this recipe.. So happy you liked the recipe and are enjoying the blog! !What are you excited about growing? Thanks for the support!